A guy stands on the crest of a roof with nothing but a power line between him and the hoop. He winds up and chucks the basketball in his hand high into the air. It bounces off the top of the wood pole, against the end of the earth (or the iPhone landscape), ricochets against the power line on the other side, and scurries around the backboard and rim until, bam, it’s in! This is Dude Perfect, and while the feeling of sinking a Hail Mary shot is wonderfully rewarding, the game itself isn’t exactly nothing but net. Instead, this Blackbox Interactive title inspired by the trick shot YouTube videos is fun but flawed. It has a ton of potential, but it needs some work before the exhilarating power of landing longshots can truly be appreciated. Dude Perfect starts by setting characters up in situations that make Happy Gilmore’s famous golf shot look like a layup. 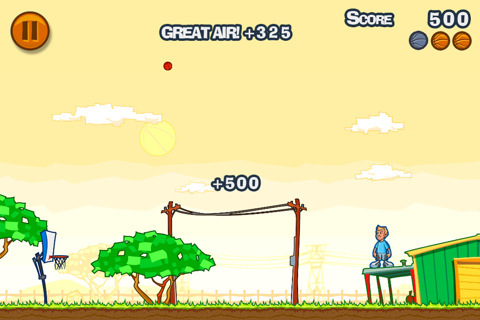 Clouds present themselves as obstacles, blimps fly by every now and then, and the more objects the ball touches before it lands in the net the more points your character gets in the long run. 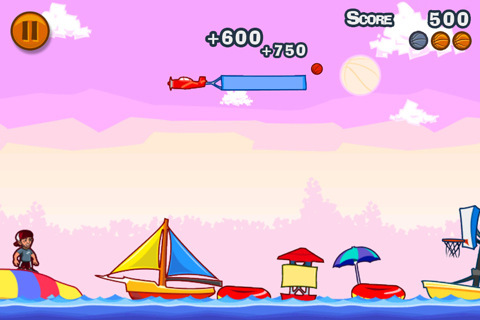 Each level presents the player with a specific number of basketballs and similar to the Angry Birds setup, you pass the level whenever you’ve achieved the goal of making a basket. The unused basketballs get racked up as extra points, and the total point tally determines whether you’ve achieved zero through three stars in passing the level. 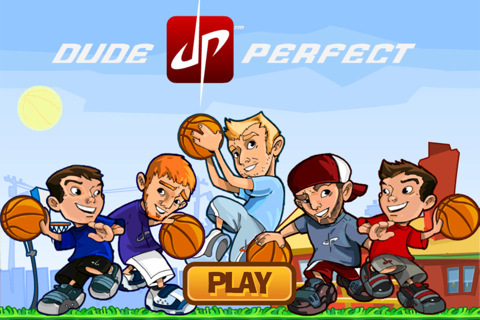 Conceptually the idea for Dude Perfect is excellent but it’s not quite as exciting as it ought to be. Moving through the game and between levels is nothing short of a process and almost everything requires more taps than it ought to. Where you’d expect to be able to click anywhere, the game requires you to touch buttons with not the clearest of meanings. In this way the game feels a bit amateurish and feels like it was built by a student programmer or someone who is accustomed to working on games for the old Palm Pilots or Blackberries. Still, the illustrations are wonderful, the sounds are fitting, and the overall pace of the game (except for the menu issue and the fact that you have to watch the ball bounce until it becomes inert) is mostly enjoyable. The controls themselves are simple enough, requiring you to drag your finger to both take aim and control the power that’s put behind how hard the ball is thrown. The setup works well but the actual physics engine that determines how the ball bounces off objects feels a bit primitive and overly unrealistic. 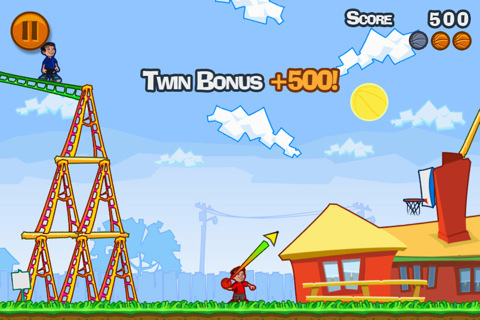 Move past these few flaws though, and Dude Perfect could be a great little iPhone game. It has the sort of formulaic approach to basketball as Angry Birds has to launching birds, which we all know can be quite enjoyable. Hopefully the developers will get in there and fix some things, the future of their game could be riding on it. Bottom Line: Basketball shooter Dude Perfect offers the thrill of turning basketball impossibilities into backyard miracles, but the controls and results feel outside of the gamers’ control.